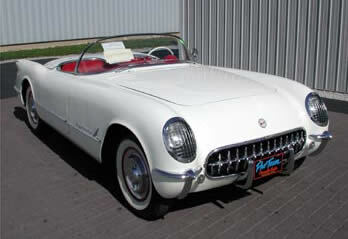 The first Corvette rolls off the line on June 30, 1953, in Flynt, Michigan. Each fiberglass-bodied two-seater was Polo White with red/white interior. Corvette power comes from a "Blue Flame" six-cylinder 235ci 150 hp engine. 235 cubic inches, 150 horsepower "Blue Flame 6"